EDITOR’S NOTE: Jeff will be on hand all day tomorrow, April 3, for students, parents, community members, and recent graduates. For details, contact Atchison High School at (913) 367-4162. A lot of people in the community and parents have reached out to me and shared with me the latest loss. First and foremost, I want to share my thoughts and prayers to the young man’s family, friends and the people that know the young man and the family. I am sorry. I was just in your community. I love your community. I wanted to come by and offer you a couple of thoughts. My friends, I don’t think suicide is ever the right decision. I think suicide is a permanent action to a temporary problem – but I get it. I understand where young people are. 1) Young people feel alone – basically it feels like you don’t have meaningful relationships. We live in a world today where we spend so much time on smartphones and social media, and it’s about balance and boundaries. I don’t really want to go there, but if you spend more than four or five hours a day on screen time, you are 70 percent more likely to have depression in your life. So – I want to encourage you – less screen time and more social engagement. And when you have social engagement – whether it’s a trusted adult, whether it is your friends – where you are problem solving, communicating and you are together – listen, that takes care of the “I am alone.” That makes sense, right? 2) The other reason is that you feel like you are a burden. This basically means that you feel that you don’t make any notable contributions to the world and that you serve as a liability – and that you are disappointing your parents, teachers or coaches because maybe their expectations are so high – and you are spending so much time on your smartphones that you are not focusing on things that are really important: Your motivation. Your school, your future – your direction. Here’s what happens: When emotionally you feel like you are alone and that you are a burden – and it lasts so long – suddenly you end up with that desire. I don’t think young people want to die. I think one of the problems is that young people live in the here and the now. Young people – you don’t know what you don’t know. Like, you don’t know what it was like at one time to not have smartphones, Internet, social media or YouTube – so you are the first generation growing up with this. I think we have done a disservice to our young people as a society. We have given young people these rights and these privileges where this frontal lobe, or frontal development has not matured and come into focus – so the emotions that come with smartphones, the Internet and social media – we’re not mature enough to emotionally handle the result of this. If your parents aren’t going to say no and teach you balance and boundaries – it’s hard for you to put that balance and those boundaries in your life – but that’s something that you have to start working on. Social and emotional learning does not come as a result of being on the screen all of the time. Online time can affect mental health in a negative way. Social engagement social interaction can help your mental health. Again – Atchison, Kansas – I don’t know the details on this young man. But I will tell you this: It’s going to be OK.
Part of being young is about having crazy emotions and feelings – and not understanding them. And it’s OK to have that trusted adult to go talk to. I spoke at a school in Indiana today, and a girl wanted to talk afterwards. The girl has been in counseling for two years. Do you know that today she told me more than her two counselors knew about her? I asked her why she felt comfortable telling me what she did. Don’t you think you have trusted adults in your life that – if you gave them the chance – they would get it too? Folks – we can’t help you if we don’t know. When you didn’t know how to ride a bike, that didn’t stop you, did it? When you didn’t know how to ask a girl out – you still found a way, right? When I spoke to that child today, I can’t tell you how many times she said, “I don’t know” in tears – and you know what I did? I just kept asking her if she felt safe and if she knew she wasn’t in trouble. As long as she knew those two things – little by little, she opened up. It was a beautiful day. My point is simply this: Suicide is a permanent action to a temporary problem. If you are afraid to talk to a trusted adult and you don’t open up to anybody – and living in the here and the now – all of this pressure is so much that you start to think that the desire is there – but it doesn’t ever need to get to the point where you have that desire. But you have to have the courage to realize that it’s OK to go talk to somebody. I am praying for you. I’m sorry, and I love you guys. Don’t be afraid to open your heart and find a trusted adult. And they are going to support you and encourage you – but you have to open up. Imagine for a second you are dealt with an emergency situation in your building, where you have to react immediately to an in-school suicide. What do you do? Do you have measures in place for such an incident? With your emergency response plans, evacuation plans, and school lock down procedures, do you have a suicide action plan in place? Let’s revisit our procedures and know what to do when we are forced to react and don’t have the time to properly respond. I have given you an example of what should be done immediately. Please use this and share with other administrators and school leaders. This week, I had two phone calls from school communities that each had to deal with an in-school suicide. One was a suicide in the bathroom, and the other was a suicide in the main gym. Could you imagine if this was your school and you were the one that was looked to as the leader? Could you imagine this happening at 7:30 am while you are preparing for another great day with staff and students? What would you do at that very moment? Whether you are a teacher or administrator, what are you going to do . . . Right Now! Before writing this blog, I called some of my trusted friends in education, mental health, and law enforcement. I wanted to make sure I was doing the right thing by getting their feedback and support before I would put this out publicly. The response from each one was met with a pause and a quick jolt of reality as we’re not expecting to have to deal with this. My friends, this is reality and we have to deal with the possibilities. I hope my words and video can serve you in your leadership and gain the trust of your families and school community. Never were you given a certificate in your administrative training where you were taught how to deal with this type of crisis. It’s real life and as leaders we have to be prepared for real life. Nobody puts anything out on social media platforms – Facebook, Twitter, Instagram, etc. * Jeff Yalden is a suicide prevention specialist and youth motivational speaker. Jeff specializes in teen inspiration and embracing parents. For 23 years, Jeff Yalden has addressed high school and middle school audiences all over the world. His presentations are fun, interactive, and memorable. When asked to bring a student body back from a suicide, Jeff is the man. He cares and comes in and makes himself available answering the questions that may never be answered, ultimately giving teens, staff, and parents an understanding of today’s teens. Jeff brings the kids to understand that life is hard, but we must move on. 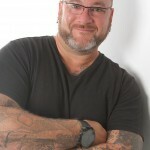 Visit Jeff’s website www.JeffYalden.com and contact Jeff for your next high school assembly. You’ll be glad you did. Suicide is never the answer! Her message could have been heard louder and longer had she been supported by her family with unconditional love and support. We could have used her voice, not her death by suicide. My name is Jeff Yalden. I am a Suicide Prevention Trainer and Celebrity Teen & Family Life Coach having worked with families and teens for 23 years. Teen Suicide touches my heart because I was there at 16 years old and 21 years old. Today, I suffer from depression and anxiety and I am diagnosed with Bi-Polar Type 2 and PTSD. This is my work and my passion. The point I want to make in this blog is about unconditional love and support in regards to Leelah and her needs not being met. I understand unconditional love. I also understand supporting your child under different circumstances. This particular issue is about how I feel when your child has emotional issues, is gay or lesbian, bisexual or transgender. In my professional opinion, the parents should have been open and understanding where their daughter needed their support and didn’t get it. Leelah needed the love and affection from her parents and family and if her parents and family chose their faith and their religious views over the needs of their daughter then they failed their daughter. That is the bottom line. I am saying “If”, because I don’t want to speculate any further about conversations within their walls of their home. In the end, this is very sad and unfortunate. Being a teenager is hard enough. Growing up in today’s world where we are on and worried about being judged by our peers is hard enough. Having to be accepted and fit in is an everyday challenge. Then, having to grow up and dealing with everyday teenager stuff and NOT having the support of our family is unfathomable and ultimately is the cause of Leelah’s decision to end her life. Her cries for help weren’t answered and they weren’t taken seriously. Read her posts . . . (Here). This is what Leelah says. In regards to her family all I am reading is that they are still referring to their daughter as “He”, “Him”, and I don’t think they are respecting her wishes. Read the latest article . . . (Here) – It’s more disturbing and speaks loudly about the challenges she faced. Again, I don’t know what the family knew or how deep her pain and needs for love and acceptance were. She was only 17 years old. Born Joshua Alcorn, a boy and at the age of four, he felt he was a girl trapped in a boy’s body. Her cries for help weren’t supported by her devout Christian parents who forced her to go to conversion therapy, which seeks to change sexual orientation through counseling. This practice has been banned in two states on grounds it is medically unfounded and puts children in danger. The argument on the internet now is whether or not the parents should be help responsible (Dan Savage) and charged. 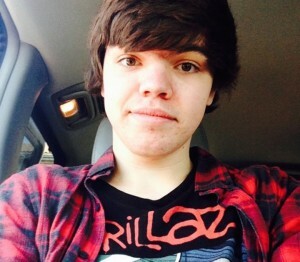 Could this suicide have been prevented if the parents were more open-minded? Sure, I think so! The message is greater than what will happen to the parents. The message needs to be heard by all parents and teens suffering emotionally and spiritually. Listen to your childs needs and desires. Open your heart to understanding that today’s teens and youth are different then when we as parents were growing up. Listen to them and understand them. Support them and embrace them in their journey. First and foremost, there is difference between unconditionally loving and supporting your child. To unconditionally love your child, but not support your child is not unconditionally loving your child. It is loving your child conditionally. To love your child unconditionally is to love and support your child, children, spouse, partner, or friend(s) for the person they are or choose to be. Think of it as how your dog loves you. Your dog doesn’t judge you. Your dog is always waiting to greet you. Your dog loves you more than your dog loves itself. You might not agree with the sexual orientation of your child or how they dress, but you support them unconditionally and lovingly accept them (period!) 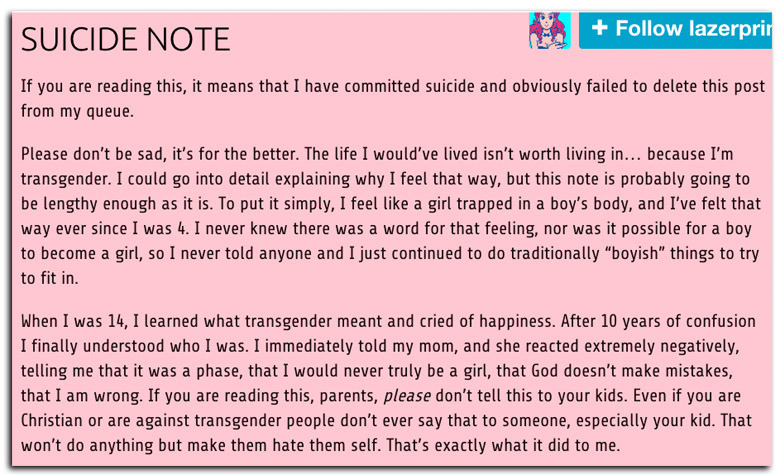 In my opinion, the parents didn’t do this and that is where I think they failed their daughter leading to her suicide. I don’t feel that scorning the parents is the answer. What does that do now? The parents are grieving and have to live with this the rest of their lives. Suicide may have freed Leelah from the pain, but now her pain is transferred to her parents and they have to live with their inner conscience of what they did right or did wrong as parents. They will pray and ask God for forgiveness as we should forgive them as quickly as society is judging them right now. This is a lesson for all parents in raising their children. Listen to the cries of your children. If you are not, you are failing your children. The parents wanted Leelah to be the Joshua they named him at birth. They wanted their child to be the perfect straight Christian little boy they had hoped he’d be. Well, at age four Leelah was conflicted. She was a girl living in a boy’s body, she says. Why wasn’t her feelings and emotions respected? Why wasn’t this supported through counseling and help? Conversion therapy isn’t the answer to a young lady at in her preteen years to 17 years old. The parents failed by not listening to the cries of their daughter. Parents fail their children everyday by not listening to the cries of their children. Using death to send a message is never the answer. The message is heard for a few weeks, but then life resumes and suddenly we will speak less and less about transgender and the loss of Leelah. There is help and there is hope. Suicide is preventable and doesn’t ever need to be the final decision. It takes courage and time. Things change over time. Everything changes over time – depression, people, things, places, life. Leelah needed love and support. She needed to be heard and not judged. Leelah needed acceptance and understanding, she needed love and support. She needed this from her family. Millions of teenagers struggle everyday in their walk through life with who they are and who they’re becoming. Society doesn’t make it easy for anyone. Everything is watched and talked about. Social media puts people on 24 hours a day and 7 days a week. Where does God and our faith come in to this? Pope Francis has started to ease up on the Bible’s teachings. Here is just one article about Pope Francis . . . (Read). Many of people in the Churches pulpit are gay or lesbian and they’ve become accepted. So, who am I to judge? In the end, I personally have to answer to God when He calls my name. You are going to judge me here. I know and that is fine. I accept it. I work with youth and families. I stand strong on who I am as a man and my morals and values. I go to Church, I pray, and I am learning to read the bible. This is what I do and I don’t expect my neighbor to do the same, but I still love and respect my neighbor for who they are. My family has their beliefs and they all walk in their faith at their pace. Whom am I to change that? 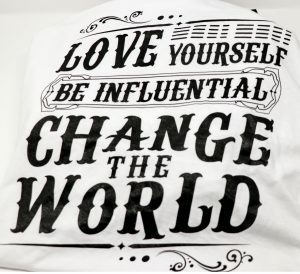 I can only inspire and influence by my actions and how I live. Understand, I am not perfect. Who is? When it comes to working with youth, teens, education, and families I have a completely different take on faith, religion, and spirituality. I try and teach young people to have courage through life’s battles and self respect to make good choices. My audience is usually teens searching for answers to life’s questions. I meet my audience at their level and where they are in life. I don’t expect my 16 year old daughter to love Jesus as I do. I can encourage the House of God, the Bible, and Prayer, but at 16 years old I know hormones and changes are more powerful than the mind wanting to know Jesus. You can disagree all you want, but I will not challenge you on how you raise your children. What works for you in your house is your business. What works for me within my four walls works for me and I am constantly open to learn and change. In time, I know my influence and how I live my life will speak volumes. The message will be received when the student is ready. Like leading a horse to water, right? To my kids, I will support them unconditionally. Circumstances will certainly play a role in how I support them and the support I show. Some things are completely unacceptable and my support will be “TOUGH LOVE.” I’ve been there and I’ll do it again. My children and your children may not understand “Tough Love”, but I promise, someday they will and they will “Thank You” for it. Our children make choices in life. This is the experience and the lessons they learn as they grow up. Personally, I want them to have a passion and enthusiasm everyday and to live life with morals and values as I try and teach them. I have my set of morals and values and my living them I hope will influence them as they figure out their own. I want them to do what is right. I will show them what is right. What is right for me doesn’t always make sense to a teen all the time. They don’t understand life yet. They’re figuring it out and I want to to figure it out through successes and failures, good times and bad times. My parents supported me and I know many times they were left shaking their heads. They loved me through tough times and supported me through many of the tough times, but they also left me to figure it out because they didn’t support a decision I was making. They gave me tough love at times and I am grateful they did. In the end, Leelah chose to end her life. This is what I am saddened about. It doesn’t ever have to end like this for anyone. There is help and people should have been more open to encouraging the help, rather than judging her for who she felt she was. Many people are at fault for the end result. Not just the parents. The ultimate responsibility lies on Leelah because she knew what she was doing. She could have gotten help rather than taking the cowardly way out leaving us all to pick up the pieces. Has Teen Suicide Affected Your School and Community? If you’ve come to this page, perhaps your school or community has experienced the loss of a student to suicide. I am sorry and my prayers and thoughts are with you. Below, I am going to share with you a video that I’ve done for a school who suffered a great loss. Also, further down from the video is a BLOG I wrote on Teen Suicide and Teen Depression. Please read and share! Let me tell you how I’ve come to help schools, families, and teens cope with suicide and loss. It’s simply as a result of the teens themselves. I’ve learned that teens want someone real and compassionate to be there to share their heart with those that are hurting and asking, “Why?” I’ve sent videos to many of schools and communities expressing my thoughts and prayers. The videos have taken on a following of their own giving comfort and hope to those that are hurting. Today, I’ve had students, Principals, and Superintendents inviting me into their schools to bring back the school spirit and school morale after such a loss. This is what I do. My energy and passion is part comfort, part healing, and part therapeutic as we move forward. Listen, administrators and I agree, that sometimes it’s just an outside voice that can say things a school employee can’t say. That is all. I can’t come in and sensationalize or celebrate the loss, nor will I. As school officials we have to be very careful how we address this issue. What we can do is celebrate our own lives and as we move forward we can invite our students to have trusted adults in their lives to open up to when their hearts are hurting. This is what I do. The power of words, combined with my heart and energy, is healing. Having said that, my job is to come in and bring back a sense of morale and school spirit and let the students know that there are trusted adults in the building they can open up to. Also, my job is to validate the teachers and staff members and encourage them to continue teaching for the reason they got in education. That is to teach young people first and let the subject area be second. Our teenagers today are stressed . . . more so than you can imagine. Whether it be standardized tests, social media, bullying, family, colleges, every day stresses, anxiety, depression, etc. They need to be taught coping skills and problem solving skills. Teens need a voice that tells them that this is the learning process of life and that no matter what they will be OK and that life will sort these stressful issues and tough times out. The bottom line, is that teens have to believe in themselves and fight the battle, but also be willing to open up their hearts. I am able to tell teens that suicide is a permanent solution to a temporary problem. It is a selfish act that leaves many people hurting. My experiences, having been suicidal before, is a welcome gust a wind to a hurting teen and fellow classmates. It is an honor that I’ve been blessed with this ability to reach deeply into the hearts of teens and make a change in their lives. If not a change, at least I give them hope that life will be OK. Here is a sample video that I have done for a grieving community and I would be happy to do one for you too. Another day and another loss. Teen suicide is becoming an epidemic. I am left speechless today as I hear about another two suicides from this past weekend. After 20 years of speaking and concentrating my work on teens and families, I feel privileged to share my heart and give people hope in such tough times. I only wish the teens hurting would have reached out to me before deciding that suicide is their answer. Every day, I feel a part of me dies wishing I could have made sense in sharing that suicide is a permanent solution to a temporary problem in the heart. But, the pain sometimes is so severe that even reaching out for help isn’t even a thought. I wish I could take the pain away from family, friends, classmates and community members. 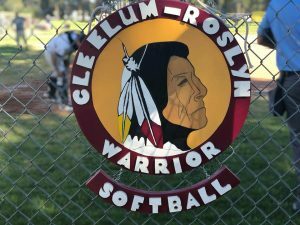 The tragic loss of a young person dying leaves parents, siblings, classmates, coaches, teachers, and administrators scrambling with so much hurt and thoughts. We are all left wondering “WHY?” and “WHAT?” we could have done to prevent such loss or done something to help. I’d like to share with you the factors that might lead a child or a young person to suicide in hope that this may prevent further tragedies. I gather this from years of experience and trying to understand. Suicide can be complex in so many ways. Relatively rare amongst children, the rate of teen suicides and suicide attempts is growing exponentially amongst teens and young adults. The cry for help amongst our government agencies is growing more and more each day. Suicide is the third-leading cause of death for 15- to 24-year-olds. For every suicide there are at least 25 attempts. Given access to firearms, the risk of suicide increases dramatically. Nearly 60% of all suicides in this country are committed with a gun. Any gun in your home should be unloaded, locked up, and kept out of reach of children and teens. The other means of suicide or attempted suicide is overdosing with prescription or non-prescription medicines. Be aware that teens will trade, buy, and steal medication and will carry them in their lockers or their backpacks. I’m supportive of schools frequently bringing in drug-sniffing dogs and searching their schools and teens back packs. Don’t think this is a punishment for a certain “type” of teen, this is a problem with all teens today. Girls tend to attempt suicide by overdosing on drugs or cutting themselves. Boys die by suicide about four times as often as girls, but girls think about and attempt suicide about twice as often as boys. Boys will use more lethal methods such as firearms, hanging themselves, or jumping from bridges or buildings. Growing up today as a teenager is harder than ever before. The reality is that all our teens are at risk. Today’s teens are feeling a lot of stress and worry to fit in socially, to perform academically, and to act responsibly. This is also a time of sexual identity and relationships. Teens are searching for understanding in the middle of conflicts with rules and expectations set by others such as parents, teachers, friends, etc. On top of this, now you have young people with mental health issues such as anxiety, depression, bipolar disorder, and more who are at higher risk for suicidal thoughts. Teens also facing major life changes such as divorce, moving, separation, military obligations, financial stresses are also at great risk. Then there is the teens feeling they are a victim of bullying that are at great risk of suicidal thoughts. Suicide among teens often occurs following a stressful life event, such as problems at school, a breakup with a boyfriend or girlfriend, the death of a loved one, a divorce, or a major family conflict. Many teens who commit or attempt suicide have given some type of warning to loved ones ahead of time. So it’s important for parents to know the warning signs so teens who might be suicidal can get the help they need. Don’t take these signs lightly. It is better to be safe and proactive rather than be on the other side wishing you had been. Many parents and adults feel that teens who say they are going to hurt themselves are, “Just doing it for attention!” Ignoring a teens cry for help just increases the chance of them harming themselves. Teens today don’t believe in the doctor’s appointments, residential treatment, and visits to the emergency room. This isn’t what the teens want. Furthermore, teens dealing with the loss of a friend do not want counselors, doctors, therapists, pastors, or priests giving them an explanation or consoling them. In my experience, having dealt with close to 40 suicides there isn’t a textbook written that can heal the pain in today’s youth having just lost a friend. Yes, we know about coping skills and the grieving process, but today’s youth aren’t motivated to have the professional help they need. More so, think “Common Sense” when dealing with a teen in your presence that has just lost a friend. Parents need to attack the issues before they become problems where we wish we had done something to prevent such loss. Be alert for a teen that is depressed and withdrawn from others. Understanding depression in teens is very important since it can look different from commonly thought perceptions and beliefs about what depression is. Instead of sadness and crying, look for problems with friends, grades, sleep, or cranky and irritable behavior. Depression amongst teens is used very loosely. Keep the lines of communication open and express your concern, support, and love without challenging and being authoritative. If your teen trusts in you, show that you take their thoughts and concerns seriously. As simple as something might sound to you, it could be like the world is caving in on them. Teens today are having trouble with coping skills and problem solving. Don’t minimize their pain or discount what your teen is feeling at these tough times. Don’t add to their hopelessness. For them, the world is coming down on them. Your teen might be uncomfortable talking with you. Don’t get discouraged, but offer or suggest a more neutral person such as a trusted adult whom they might respect and whose opinions they might value. This could be a relative, coach, teacher, school counselor, or friend’s parents. Remember, a trusted adult will share their thoughts with you the parents. It’s ok to let go for the time being. It’s about the teen at this moment. You might be afraid to ask the question. This is the time to ask if they have been thinking about suicide or hurting themselves. Don’t fear that you might plant seeds in their head. I promise you the seeds have already been planted and the questions are being asked. You need to ask and let your teen know you care and want to help. Let your teen know that IT WILL BE OK. ALERT: Just doing a quick search for “teen depression” . . . 8,100 hits a month and “teenage depression” has 5,400. In other words , a lot of people are searching google and crying for help. This could be very difficult and a conversation you never thought you’d have to have, but it’s a good idea and shows your child you care. When you need help is when you ask the question: “Have you been having thoughts about wanting to hurt or trying to hurt yourself?” This is a major red flag. The next question to ask is: “Do you have a plan if you were to hurt yourself?” If yes, immediately seek help and know this shouldn’t be taken lightly. In case of an emergency, you can call (800) SUICIDE, but often times a cry for help this should be the last resort. You want to get help immediately, but that means contacting your doctor first. Your doctor can refer you to a psychologist or psychiatrist. Contacting your local hospital’s department of psychiatry can provide you with a list of local doctors too. In the event of a crisis situation or immediate help, your local emergency room can conduct a comprehensive psychiatric evaluation and refer you to the appropriate resources. If you’re unsure about whether you should bring your child to the emergency room, contact your doctor or call (800) SUICIDE for help. No matter what it is imperative you keep all appointments even if your teen says he or she is feeling better and doesn’t want to go. 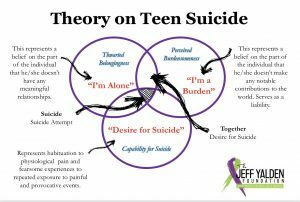 Thoughts of suicide tend to come and go, however, it is important that your teen get help developing the skills necessary to deal with pain and thoughts of suicide. Your teen can refuse going to the appointment. In this case, you should still go and work with the medical professional and find ways to help your teen want to get help. This could also be beneficial for you and the support you need to learn how to deal with and address these issues with your teen. Ongoing conflicts between parents and a child who is feeling isolated, misunderstood, devalued, or suicidal, can fuel the fire and add to their pain. Get help to address the family problems and learn to solve problems in a more constructive way. Also, let the mental health professional know if there is a history of depression, substance abuse, family violence, or other stresses at home, such as an ongoing environment of criticism. If your teen has experienced the loss of a friend, family member, or a classmate the first thing you should do is embrace their many emotions. Some teens feel guilty and responsible. They feel that they could have helped or they may have misunderstood the cries for help. Others feel angry with the person who committed or attempted suicide for being so selfish and not thinking about others who loved them. Still others say they feel no strong emotions or don’t know how to express how they feel. Reassure your child that there is no right or wrong way to feel, and that it’s OK to talk about it when he or she feels ready. Also, let your child know that you are there to talk or just listen. Many schools address a student’s suicide by calling in special counselors to talk with the students and help them cope. If your teen is dealing with a friend or classmate’s suicide, encourage him or her to make use of these resources or to talk to you or another trusted adult. Today’s teens don’t really seek these professionals, but with your encouragement and a few teens going together, these professionals can help a teen cope. Maintain contact with others. Suicide can be a very isolating experience for surviving family members because friends often don’t know what to say or how to help. Seek out supportive people to talk with about your child and your feelings. If those around you seem uncomfortable about reaching out, initiate the conversation and ask for their help. Remember that your other family members are grieving, too, and that everyone expresses grief in their own way. Your other children, in particular, may try to deal with their pain alone so as not to burden you with additional worries. Be there for each other through the tears, anger, and silences — and, if necessary, seek help and support together. Expect that anniversaries, birthdays, and holidays may be difficult. Important days and holidays often reawaken a sense of loss and anxiety. On those days, do what’s best for your emotional needs, whether that means surrounding yourself with family and friends or planning a quiet day of reflection. Understand that it’s normal to feel guilty and to question how this could have happened, but it’s also important to realize that you might never get the answers you seek. The healing that takes place over time comes from reaching a point of forgiveness — for both your child and yourself. Counseling and support groups can play a tremendous role in helping you to realize you are not alone. Some bereaved family members become part of the suicide prevention network that helps parents, teenagers, and schools learn how to help prevent future tragedies. Jeff Yalden is a professional youth motivational speaker and teen expert helping teens and families. His message has been heard in all 50 states and to youth representing over 48 different countries. To find out about Jeff and his message coming to your local high school, please visit www.JeffYalden.com or read Jeff’s blog at www. JeffYaldenBlog.com.